Translation from Estudos Sociedade e Agricultura, Rio de Janeiro, vol. 18 no. 1, p. 5-55, Abril 2010. The paper examines the institutionalization of geographical indications for wines in Brazil. The emphasis is on establishing evaluative disputes within the hybrid forums where different actors seek to build a collective agreement concerning the norms and standards of production. From a conventionalist approach, the authors highlight the different understandings of quality presents in the discourses and practices of the actors involved in the construction of this qualification mechanism. The results derived from research conducted in the regions of Serra Gaúcha (Rio Grande do Sul State) and Vales da Uva Goethe (Santa Catarina State), demonstrate the conflict (as well as hybridization) between market​/industrial and domestic/patrimonial values. Keywords: Conventions of quality, Geographical indications, Wine market. The conceptual approach of the issue of geographical indications (GIs) should be put in evidence to show how this tool aims to achieve an appreciation of traditions, customs, knowledge, practices and other intangible assets associated with a territorial identity and geographical origin (Bérard and Marchenay, 2008; Cerdan et al., 2009). In this sense, GIs are recognized as a qualifying strategy that emphasizes the socio-cultural embeddedness of the product in the territory where it is produced. By qualifying intangible assets that are difficult to transfer to other territories, the same GI can be conceptually perceived as a catalyst of processes for territorial/endogenous development (Allaire and Sylvander, 1997; Cerdan and Vitrolles, 2008), establishing itself as a counterpoint to the general dynamics of the agro-food system in terms of globalization, standardization and concentration of markets (Benko and Pecqueur, 2001). Nevertheless, this rather general perception must be reassessed in light of a particular dynamics of each "geographical indication" system made locally. A research conducted under the Siner-GI project3 has shown the enormous heterogeneity of these systems around the world, which involve different networks of actors, governance mechanisms, institutional formats of markets, political support and, finally, different impacts on the dynamics development of the territories regarding (Vandecandelaere et al., 2009, Allaire et al. 2007; Allaire and Sylvander, 2006). A plausible conclusion from these researches can assure that GIs are a general concept that makes sense for different contexts and social actors. In fact, its strength lies precisely in a flexible manner that allows social actors to mobilize peculiar material and symbolic resources of each territory. The way GIs are linked to the dynamics of the territories depends on the specific format that this mechanism takes after an extensive process of negotiation about the conceptual and normative aspects. GIs are an institutional innovation built in a hybrid context in which different actors and artifacts interact to make up a new socio-technical regime (Callon, 2008), providing a set of rules and production standards that are to guide collective actions (Eymard-Duvernay, 2009). As the sociology of conventions has endeavored to demonstrate, in the course of this process, the actors mobilize different values in order to justify discourses and practices consonant with the recognition system (and classification) aim to devise. These values are associated with distinct "principles of justice" that guide people's engagement with the world and are associated with different ways of qualifying products, people and territory (Boltanski and Thévenot, 1991; Thévenot, 2006). From an interpretive approach, the article proposes to analyze this social process of "collective creation of normative rules and collective procedures to settle normative disputes" (Joas, 1987) associated with the institutionalization of Geographical Indications. The focus is on the multiple and contradictory forms of appropriation of this mechanism in the Brazilian wine production, particularly in regard to ongoing projects in Serra Gaúcha, the leading and most traditional wine region of the country, responsible for about 90% of the wine produced. Besides having the first Brazilian geographical indication (Vale dos Vinhedos is recognized for fine wines in 2002), the region has five projects under development, which became a kind of knowledge cluster (Giuliani, 2007) for the development of GIs in Brazil. The hypothesis that has guided the research asserts the existence of a dual process of institutionalization of GIs in the wine sector. At the same time that this instrument has prompted the valuation of the territories and their cultural identity, we are witnessing a process of "sectorial appropriation" through which it is adjusted to serve as a catalyst for organizational and technical innovations considered necessary for local enterprises react to the loss of competitiveness of the Brazilian wine in the market (Fenstersifer, 2007)5. Thus, within a context of competitive hybridization strategies in the wine market, these projects have reconciled conceptual models of two formerly antagonistic worlds (Garcia-Parpet, 2007; Barham, 2003). On the one hand, actors started using a characteristic mechanism of the winemaking from the "Old World" based on the valuation of the "terroir" and traditional methods of production, the institutionalization of rarity and delineation of privileged geographical areas. On the other hand, in the course of this institutionalization mechanism process − i.e., when formalizing the agreements on the standards that constitute the Code of Practices − actors seem to seek adequacy to "needs of modernization of the wine production". On the threshold of articulation of these two models, a discussion emerged on the very possibility of a GI becoming a means of technical standardization that, in a more extreme situation, could lead to a loss of historical and cultural ties with the territory of the product (Delfosse, 2007; Bérard and Marchenay, 2004; Sainte Marie and Casabianca, 1997). The article is divided into three main sections6. First presents the context of the Brazilian wine market, the role designed for geographical indications in this scenario and the projects for qualification under development. Then three different negotiation processes related to the institutionalization of the GIs are discussed, such as: a) the change in strategy of a group of wineries from Garibaldi, a town of Serra Gaúcha renowned for its production of sparkling wines, who initially demanded a GI, but, in view of many obstacles, redirected their efforts to build a collective trademark; b) the qualified project undertaken by the producers of Vales da Uva Goethe in Santa Catarina, which has suffered a strong opposition within the wine industry because of their demand for the GI to be for a variety of hybrid grapes and c) the process of choosingÂ varieties of grapes allowed by the Code of Practices (Cahiers des Charges) of the Designation of Origin Vale dos Vinhedos. From the description of these three cases, the last section provides a brief analysis of the qualification process occasioned by the projects of GI in the wine sector in Brazil. In this section we analyze why the projects of GI for wines in Brazil are roughly a tentative answer to the loss of competitiveness of the local enterprises facing an increasingly globalized and volatile market. This discussion begins with a historical overview of the sector, demonstrating the multiple reasons for the present context of "crisis". As it will be argued, to some extent these reasons justify the development of an understanding that sees the IG projects as an opening of a new opportunity for the modernization of local wineries. According to Protas (2008), this process of modernization was blocked during the 1980s due to the closure of the domestic market, which has created a hardly conducive situation to innovation. So when opening of the market and creation of the Mercosul in the early 1990s, it became one of the main reasons for low competitiveness of the sector in comparison with other competitors, especially Argentina and Chile. Tonietto (2003) suggests a subdivision of the Brazilian wine history into four periods. The first corresponds to the establishment of the viticulture in the Serra Gaúcha region with the arrival of the Italian immigrants in the late nineteenth century and extends to the end of the 1920s. The second is between the 1930s and 1960s: a phase of product diversification, with the consolidation of the sparkling wines and, improvement of the wine quality due to advances in processing technology. Between the early 1970s and late 1990s, there is a third generation, marked by a significant increase in the area planted with Vitis vinifera and in the qualitative development of varietal wines. Finally, the current period characterizes a transitional phase toward a fourth generation distinguished by the introduction of quality certification, seeking to consolidate regional identities for the Brazilian wines. But what has made these generational changes? What are the elements of continuity and rupture between these different stages of evolution? We will devote a few paragraphs to understand this trajectory in a more dynamic way. The aim is to highlight that more than setting up a new evolutionary generation, the current period is particularly interesting because it brings out the contradictions arising from this "unresolved problem" that was the process of modernization of the sector. Initially, it should ratify the Serra Gaúcha region as the leading wine region in Brazil. Wine production is based on a broad participation of family farmers, which is represented by approximately 12 000 small establishments cultivating 31 000 hectares of vineyards. Wine production is due to the approximately 600 producers among large enterprises, cooperatives and family wineries that jointly industrialize 350 million liters per year (Niederle, 2009). Since its inception, the wine of this region was based on the production of table wines, which has been produced from varieties of American and hybrid grapes in the basements of the immigrants' homes, under inadequate sanitary conditions, has always been regarded as of "low quality" (Rodrigues, 2007). From the 1920s, with the emergence of a category of "dealers", the marketplace, which was until then local, was expanded to other regions. These dealers implemented the first wineries and were responsible for a process of improving the quality of the wines. In some cases, it was in the vicinity of those wineries that formed cores of settlements, which later gave rise to villages and towns (Paris, 2006). In the following decade, the trade circuits reached the center of the country, giving a new impetus to the capitalization of these wineries and the rise of the industry (Jalfin, 1991). However, it was not until the 1960s that the industrial sector found itself facing an abrupt process of socio-technical transformations. The interest in building a modern wine industry led the Brazilian government to finance the emergence of a large entrepreneurial-industrial segment. Initially, the structure of this segment privileged the formation of various types of contracts between Brazilian and foreign companies, especially importers who were facing importation barriers established by the imports substitution program, began investing directly in the Brazilian industrial sector. It was thus, for example, that the Aurora winery cooperative signed a trade agreement with the French importer Bernard Tailan, which served as a catalyst for a broad process of technical innovations leading the company to become one of the largest nationwide wine industries (Jalfin, 1993). From this moment onwards, the vast majority of farmers had become a supplier of grapes, keeping the wine production almost exclusively for family consumption. If, as Jalfin asserts (1993), until the 1950s, the industry was characterized by the subordination of the winemaking process to the need of selling the agricultural production, from this period, the logic is reversed and it is the industry, with its need to conquer new markets, introduces a systematic way of changes in production organization. From the 1970s, the entry of multinational companies such as Chandon, De Lantier, Martini & Rossi and Forestier changes the scenario from the viewpoint of the leading actors of the market, occasioning the weakening of local wineries, especially the cooperatives which experienced a serious crisis at that time. This moment also marks a crucial turning point with respect to the beginning of structuring a supply chain of fine wines. However, while innovations in winemaking have been relatively quickly and successful, changes in the grape productions were so bleak (Camargo, Protas and Mello, 2002). Even with the gradual process of conversion of vineyards to cultivars of Vitis vinifera (and consequent massive introduction of agrochemicals that still stands today), the quality standards of the grapes were still far from making the Brazilian products competitive and recognized in the world of wine. During the 1980s, most local industries survived due to the closing measures of the Brazilian market to imports, which guaranteed a spurious competitiveness for the domestic industry. Furthermore, it should be emphasized that in this period, much of the wine produced was destined for the production of vinegar or distilled to produce "cognac". This scenario created a particularly harmful situation to the "modernization" of the sector, since the domestic industry had a stable and relatively large demand in wines of low quality and did not face any competition that could make the processes of innovation and upgrading of production imperative. This situation has changed suddenly from the 1990s. The table wine industry has seen demand plummet for product according to authorization for the production of "conhaque" by maceration of ginger and by replacement of vinegar by "agrin", which has only 10% of wine in its composition. Moreover, since then there has been a growing substitution of consumption of these wines for by products, such as cocktails and sangrias, which have a lower percentage of wine in its composition. As regards the sector of fine wines, the crisis was due primarily to the loss of space in the domestic market under the new framework of regional integration in the Mercosul and the openness to international trade, which forced domestic producers to compete with more competitive products in quality and price (PROCISUR, 1999; Santos, 1999; Lapolli et al., 1995). Another component of the loss of competitiveness of the Brazilian wine was the redirection of the investments of lots of multinational companies to other countries. The closure of some of these companies sharply reduced the demand for grapes. Thus, cooperatives and industries that remained active found themselves, on the one hand, facing a huge oversupply of grapes prior to these companies and, on the other, with a decreasing demand for domestic wines. The immediate consequence was the reduction in prices paid to farmers for grapes, placing them against a scenario of strong economic and social vulnerability. With regard to the measures adopted by the government to stop the crisis, they were just palliative. In fact, the industry was considered a "bargaining chip" in negotiations of the Mercosul, in particular because the commercial interests of other industries seeking to expand their participation in the regional market (Santos 1999). In addition, specific bilateral agreements predicted even smaller export tax than those performed in the Mercosul (27%).7 Consequently, without a structural action to make the Brazilian production competitive or increase consumption of products, governmental actions are fundamentally based on export bonus and purchase for distillation, measures that reduce inventories momentarily, but at the end of the day reinforce the cyclical crises that hit the segment (Protas, 2008). The most innovative response to this situation was the arrival on the scene, also from the mid-1990s, a set of small wineries. Farmers with more capital articulated a network of independent family wineries of the most traditional marketing and production circuits. These wineries invest on products of higher quality and added-value, turning to differentiated markets, mainly by selling directly to consumers. The main impetus for the development of these enterprises was the rapid growth of tourism in the Serra Gaúcha region (Valduga, 2007). These family wineries showed a renewed capacity for innovation and economic inclusion. Sectorally, the main changes involved the increasing vertical integration in order to gain greater control over the quality of raw materials and reduction of transaction costs (Gollo, 2006). With greater control over the quality and scale, vertical integration was one of the main competitive advantages of these enterprises vis-à-vis cooperatives and larger industries, which have difficulties to integrate vertically their production because of topographical conditions and land ownership framework of the region which prevent the whole mechanization of production (Miele and Zylberstajn, 2005). However, this process again has excluded the majority of farmers, resulting in a situation of strong asymmetry in the distribution of gains (Flores, 2007). At local level, the emergence of these family wineries, working collectively from their associations, allowed the formation of a new institutional environment, which, according to Flores (2007, p.114), reveals an early stage of development with "strong endogenous features". In fact, the formation of a network of actors and organizations, whose spatial proximity facilitated the flow of information and knowledge essential to innovation, has become a determining factor in the reconfiguration of the socioeconomic and political relations in the territory. The pace of change was so intense that in less than two decades, expressionless actors in the local political scene began to set up "the new economic and political elite" (Flores, 2007, p. 5). The most widely reported case in literature that shows the strength of these new actors and the changes engendered in the local dynamics is of Miolo winery (Sato, 2004; Silva et al., 2005). Founded in 1989, this winery began as a supplier of table wine in bulk to bottlers in other states. In 1994, they began bottling the wine with the family trademark, and since then, from a plan of partnerships and joint ventures with national and international enterprises (counting especially on a wine consulting and marketing globetrotter Michel Rolland), the company has expanded to become a production leader in Brazil, with about 12 million liters annually. The most recent investment of which is now called Miolo Wine Group was the acquisition in 2009, of the Almadém's premises in the Campanha Gaúcha region, a French company of the Pernot Ricard group responsible for an annual production of about 4.5 million liters. Under the conditions that this debate is established, it is necessary to bring back the opening issue of the Brazilian market to imported wines. Although initially the family wineries had found room to grow in betting markets and direct wine tourism, they were faced with enormous difficulties to expand their operations to more extensive circuits. During this period, the large retail was "invaded" by imported wines, between 2002 and 2008, and saw their market share go from 48.8% to 76.2% (Uvibra, 2009). Currently, Chilean and Argentine wines occupy about 50% of the Brazilian market. In addition to the opening of the market, these countries took advantage of the real exchange rate appreciation and rising purchasing power of the population to undertake marketing and pricing strategies that have won this huge potential market − still asleep in view of an average consumption of only 1,8 liters per person annually. In view of this situation8, an understanding was set up among experts and industry representatives that the only sustainable alternative for the country to overcome its unfavorable position in the global value chain is invest in innovations that enable the production of quality wines at competitive costs. In this sense, national companies started different strategies that generally had two ways. On the one hand, some wineries bet on the implementation of vineyards in new producing regions like Campanha Gaúcha and Vale do Rio São Francisco, searching for wines of high qualities and cost reduction by increasing the scale of production, mechanization and sanitary quality of the soil. In another way, there are enterprises focusing on local alternatives, trying to benefit from the growing importance given to specific territorial attributes, particularly by linking the product with its natural and socio-cultural identity and tradition. In this sense, Geographical Indications projects are created for. The initial proposition came from Embrapa Uva e Vinho. In search of alternatives to regain competitiveness in the market, wineries bet on a concept that was being proposed by the institution (Tonietto, 2005). Thus, Embrapa began to coordinate and articulate around itself a wide range of actors and organizations (Fig. 1), constituting a sort of "bridge" through which resources and basic information circulate for setting up projects: it raises funds (CNPq, Fapergs, FINEP) for the development of technical studies; articulates a body of technicians and experts to implement the projects (UCS, UFRGS, IFRS); integrates the producers' associations into a common project of recovery and regionalization of wine production; intermediates contracts between local actors and organizations involved with this type of policy at national (MAPA, INPI, Sebrae) and international level (OIV) and; through a fine synergy of actions with the Brazilian Wine Institute (Instituto Brasileiro do Vinho),Â makes the theme part of the agenda of the entities (Uvibra, Fecovinho, Sindivinho etc.) and the Wine Sector Chamber (Câmara Setorial do Vinho), an advisory collegiate forum of the Ministry of Agriculture. The first project began to be discussed from the constitution of the Producers' Association of Vale dos Vinhedos (Aprovale) in 1995, which gained recognition of their Indication of Origin in 2002. Since then, besides the Designation of Origin project for Vale dos Vinhedos, a number of other projects for Indication of Source, began to be structured in the Serra Gaúcha region (Pinto Bandeira9, Monte Belo do Sul, Farroupilha, Garibaldi, Nova Pádua and Flores da Cunha) and also in other producing regions Â (Vales da Uva Goethe in Santa Catarina and Vale do São Francisco in Bahia e Pernambuco. This set of actions has triggered an extensive discussion about the "ideal" system of qualification for the local wine production, which continues at full steam, since the rules and standards of production constituents of the Code of Practice in all the projects, are still under negotiation. It is not part of the scope of this paper a detailed presentation of the different projects mentioned earlier. Our starting point to propose an interpretation of the dynamics of the geographical indications in the wine industry in Brazil is quite distinct, favoring some negotiation processes underlying their institutionalization. No claim to be an exhaustive analysis, we have decided to focus on three particularly interesting events to analyze the constitution of a socio-technical network concerning the projects and the justifications the actors have produced in order to consolidate a system of geographical indications in consonance with their economic interests, or not. The first event to which we refer is the change in the qualifying strategy operated by a group of wineries from Garibaldi, a town in Serra Gaúcha. Reputed for producing sparkling wines, local producers started to build an Indication of Source, but were compelled to redirect their efforts to create a collective trademark. The main question here concerns precisely the factors that led to this change in strategy. Nevertheless, if the reputation of the town is already consolidated for some time - in addition toÂ the rivalry built over the neighboring municipality of Bento Gonçalves, which is renowned as a producer of fine wines - it was only recently that research emerged establishing a direct relationship between product quality and the different characteristics of the terroir. Currently, besides the product being recognized by the strong socio-cultural embeddedness in the territory, some researchers have shown that a combination of soil and climatic factors makes the Serra Gaúcha region "one of the best in the world" (Sluszz and Padilha, 2008) for the production of grapes for making sparkling wines, especially Riesling Itálico, Chardonnay and Pinot noir (Zanus and Tonietto, 2006; Tonietto and Carboneau, 1999). Thus, in view of favorable conditions for the construction of a GI in 2007, a group of eleven small and medium-sized wineries created the Consortium of Producers of Sparkling wines from Garibaldi (CPEG). The goal was to qualify the local production by establishing a set of procedures to be followed by every member of the consortium. The first step toward the GI was to find partners to achieve the necessary technical studies for the construction of the Code of Practices.Â However, the project ran into a conceptual difference concerning the prerequisites for certification. The problem is associated mainly to the fact that, despite being the largest and most renowned producer of sparkling wines in Brazil, the town of Garibaldi does not have a substantial wine-growing area, so that, most of the grape comes from other neighboring municipalities, especially Monte Belo do Sul. With this in mind, some actors considered inappropriate to further the project, especially the technicians from Embrapa Uva e Vinho. 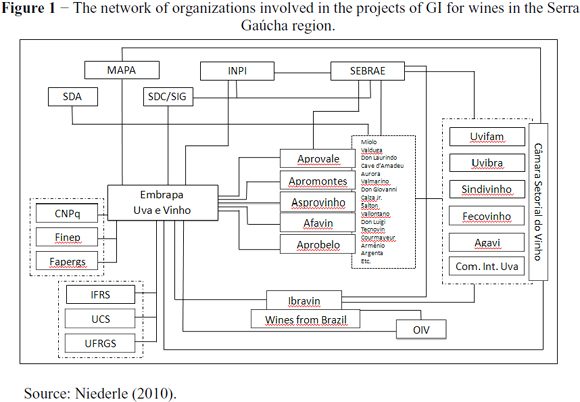 Since they started working with the issue in Brazil, from the Vale dos Vinhedos project, Embrapa researchers have constructed a kind of conceptual model of GIs for the wine industry in Brazil. Among the assumptions of this model is the principle expressed by one of the researchers interviewed that, "wine production has special features that characterize it in the world, but if you have something that gives recognition to the wine, is where the grapes come from". That is, the fact of the grapes processed come from another region would be an insurmountable obstacle to identify the relationship between the "terroir" and the sparkling wine produced, so that would not make sense to work in the construction of a GI. However, if the producers wanted to carry out the project, there would be no legal impediment to the demand of the GI, be it an Indication of Source (IS) or a Designation of Origin (DO). The Industrial Property Act (No. 9 279 - 05.14.1996) that in two paragraphs deals with the subject, states that an Indication of Source is the "geographical name of a country, city, region or locality of its territory that has become known as a center for extracting, producing or manufacturing a product or providing a particular service". In turn, the Designation of Origin is of a more restrictive nature, requiring that the qualitative characteristics of the product should be directly linked to natural and human aspects of the territory, concerning "the geographical name of the country, city, region or locality of its territory, which designates a product or service, whose qualities or characteristics are exclusively or primarily linked to the geographical environment, including natural and human factors". In practical terms, that is, with regard to how the legislation has been operated by the agents, while the recognition of an IS resides primarily on the reputation of the product and territory, the DO requires scientific proof of differential qualitative characteristics related to the "terroir". Garibaldi's reputation as a producer of sparkling wines has never been in debate, so there are no arguments challenging the adequacy of the project for this particular item of legislation. Moreover, in the case of IS, it is usually operated with the requirement that only one of the processes (production, processing, marketing) must necessarily occur within the delimited area. Anyway, the fact is that the producers have given up the project. The main obstacle was the difficulty of articulating a sufficiently broad and integrated socio-technical network to create and maintain the GI. Without the partnership with Embrapa, the producers would find it difficult to fund and develop the technical studies necessary for the construction of the Code of Practices, and after recognition, they would not be able to implement the measures of control and evaluation required (chemical, sensory, organoleptic etc.). Finally, we point out a change in the principles that justify the construction of a collective effort to product qualification. While the project of GI contained a more evident territorial appeal even clearly linked to the appreciation of the product in view of its socio-cultural roots, the shift to a strategy of collective trademark, also involved a redefinition of these principles. Now, the actors are engaged in the construction of a qualifying mechanism associated with a mode of sector governance with the predominance of industrial and commercial justifications (Allaire and Sylvander, 1997; Fort, Peyroux and Temri, 2007). In view of this, they even argue that the losses resulting from the abandonment of the IS project can be offset by a more strict preoccupation with the implementation of controls on the production process. This argument is particularly evident in relation to the external certification system appointed by the RAC, that is, an external audit by an accredited certifier appointed by INMETRO. According to producers, this type of control gives credibility before consumers and becomes a difference in quality compared to wines of GI, which rely exclusively on a system of collective self-control (at least until now). As the president of the consortium stated for a local newspaper, "What interests us is the customer, the consumer of the certified sparkling wine from Garibaldi, he knows that there is someone from outside, following everything that we ourselves are not supervising. (...) The consumer needs to know that someone is endorsing compliance with the rules, because it is not worthwhile being a good promoter of a rule that no one meets" (Jornal Bon Vivant, 2008), alluding to the difficulties concerning the mechanisms of self-regulations provided by the Code of Practices of the GI system. Summarily, the actors have implemented a certification procedure and a industry-focused regulatory ceased to value the "territorial quality" of the product contemplated by tradition, reputation and know-how associated with the practice of producing sparkling wines. The second example that we will refer to concerns the emergence of a dynamics of development that combines wine appreciation of the Goethe wine to the Italian culture and the mobilization of specific territorial assets. This is the winemakers' GI project from the region of Urussanga in the state of Santa Catarina. If, on the one hand, the project has provided the organization's supply chain and product qualification, on the other, it has created conflicts with reference to the discrimination of the hybrid character of the cultivar Goethe, which led to a particularly interesting situation to understand how different actors conceive this mechanism of qualification. All over the regions of Italian colonization in southern Brazil, including Urussanga, the first attempts to implement the cultivars of Vitis vinifera failed because of the local soil and climatic conditions.15 Thus, producers embarked on the production of American cultivars (Vitis labrusca) and hybrids, which are still today the basis of the Brazilian wine production: Isabel, Bordô and Couderc for red wines; Niagara, Villenave and Goethe for white ones. Among the major hybrids, Goethe is mainly used for fresh consumption and for the development of typical and unique white wines characterized "by the straw-yellow color with greenish reflections and [...] unmistakable aroma, pleasant and fruity" (Mariot, 2002). Originally from the United States, the cultivar is the result of a crossing between Moscato de Hamburgo16 and Carter17, which gives it a predominantly wine composition (Velloso, 2008). The Goethe variety has been grown in the region of Urussanga since the beginning of the twentieth century and, has adapted easily to unfavorable soil and climate conditions to wine grapes (especially with regard to humidity). A natural mutation of the vine allowed the farmers to exploit its full potential by linking the common variety and its clone (Velloso, 2008). The cultivar Goethe has been studied since 2005 by researchers of the Epagri and UFSC (Borghezan et al., 2008), its typicality has been the object of a national recognition since the 1950s, as suggested by the medals conferred on the "white wine from Urussanga" exhibited at the current Cadorin Museum, home of the old winery located in the town. The region is then considered "the wine capital", i.e. white wine, and consecrated "land of good wine and the Italian culture" (Rebollar et al., 2007, p. 30). As mentioned earlier, the establishment of multinational companies during the 1970s led to profound changes in the wine market with the recovery of the European cultivars and the changes in the ways of conducting the vine18. In the region of Urussanga, producers pulled the hybrid cultivars gradually to deploy the wine grapes, until when the idea to win back customers and revalue a typical product associated with culture and identity of the Italian settlers. Motived by the goal to "regain prestige" and reputation of the Goethe wine, and value a "noble and singular" product capable of "promoting income generation and regional development" (Progoethe, 2009), producers of the region sought to re-stimulate the production of Goethe wine. From a concern for the collective construction of a geographical indication project, farmers and winemakers have created the Progoethe (2005), with the primary mission "of promoting the union of Goethe wine producers and the image of a noble product nationally and internationally known"(Progoethe, 2009). Staffed by researchers and technicians from Sebrae, Epagri and UFSC, the members worked on improving the quality (physical-chemical and organoleptic) of the wine and in the revaluation of a product strongly embedded in the territory (Cerdan et al. 2009; Velloso, 2008). At the same time, producers and technicians have appropriated identity references (Italian culture) and heritage (architecture, landscape, colonial and Italian cuisine) and formalized a process of social construction of quality based on the embeddedness of local products, in tourism development and the GI. The dossier for the demand of an Indication of Source collected the elements required by the INPI, namely, evidences of economic and historical importance of regional production, its reputation, as well as a code of practices validated by a control system. However, the project has been challenged because of the controversies surrounding the hybrid character of the Goethe cultivar, which, despite its wine genetic dominance (Velloso, 2008), it is used for the preparation of "table wine", according to the Brazilian law N. 7 678/1988 which differentiates this product from the one called "fine wine", exclusive designation of those wines made from European cultivars (Vitis vinifera). Thus, criticism from some governmental bodies and the very wine industry (producers and technicians) argue that recognition of the region of Vales da Uva Goethe as an IS, may discredit the Brazilian system of GIs and jeopardize the recognition of the Brazilian fine wine in the international market, mostly European. In this conflict different interests and arguments operate, which can be understood to such an extent that it is perceived in the daily activities of the actors, "they seek to devalue a form of justification for valuing another" (Boltanski and Thévenot, 1991, p. 24). In general, even critics of a GI for Goethe wine recognize that the project meets all the requirements for the request: the product has notoriety and is closely related with the territory. Some go on to say that "there may not be in Brazil, a region that so perfectly meets the requirements imposed by the INPI to grant an IS as the Urussanga with the Goethe wine, [since] it is a product strongly linked to the culture of the region" (Researcher interviewed). However, this is contrasted by a technical justification that devalues this appeal to tradition and reputation as a sufficient condition for the recognition and, therefore, questions the very legal definition of the mechanism of the GI in Brasil.19 From this perspective, the recognition of the Goethe wine in the "current conditions" would create a gap in the "harmonious relationship" until then between the GI and product qualification. In fact, in other projects for the wine segment it was built an understanding between the actors that the great merit of the GIs, "as we have done here in Brazil, has challenged the productive sector to produce quality" (Researcher interviewed). Now, what if this mechanism is used to recognize a wine that, according to its critics, "has no quality"? To anticipate the possible misfortunes of the supposed discredit of the system of geographical indications, some actors involved with the projects began to argue that, in fact, "quality is not what the GI system certifies, but just the origin of the product". As stated by an industry leader, "it is not written anywhere that GI certification is a certification that makes a qualitative assessment of merit. Not so!". Thus, the project of a collective trademark may now be considered even more interesting on the grounds that "in this case it is much more meaningful to talk about quality because then I'm sure certifying standard of quality." However, this type of positioning goes against one of the main reasons we have built in the projects underway in other regions, namely, the alleged "quality challenge launched by the GIs". A different understanding is still being negotiated. One spare argument is that "only the Indication of Source would fall into disrepute because it is much looser and does not require proof of a different quality related to the terroir". This statement, uttered by an investigator, has two assumptions. First, it is only the Designation of Origin has a real "qualitative component" related to it, since it requires a link between the specific qualities of the product (here designed primarily as physical-chemical, organoleptic and sensory) with the geographical environment. Second, face to this requirement, the Vales da Uva Goethe region, as well as other producing regions of table wines, would not be able to request a DO. From this understanding, the IS is basically a "unique opportunity to organize the productive sector, increase the knowledge about the region, establish technical criteria for production and to promote an improved quality of our products through a modernization of our production systems... [this would allow] ... to reach the level required and expected of a designation of origin "(ibid). Ultimately, this understanding eventually reduces the DO to a mechanism for recognition of quality attributes inherent to the product - as a "design rules" defined by Allaire (2004). The clearest example is in some projects where the trademark is seen with a role similar to that designed to IS. We have already seen that in the Garibaldi case and, the same can be said about the project of the "Altitude Wines" in another region of the state of Santa Catarina. There the demand of an IS was considered inappropriate due to the recent development of the local vineyard, and therefore the lack of notoriety and historical link. Thus, it is expected that, due to the technical advances that will be provided by building a trademark, it is possible in a second moment, "to directly migrate to the DO". A fact that may change the course of this discussion concerns the changes that are taking place in international rules. In fact, international law, particularly in reference to the European system, considers the American and hybrid cultivars unsuitable for wine. Consequently, there is no GI registered for this type of product. In 2008, however, the European regulation opened the possibility of demand of Protected Geographical Indication (PGI) for wines made from hybrid varieties (Regulation 479/2008, Article 34). Will this trend be followed in international level and /or in Brazil? Some countries have managed to rehabilitate and legitimize their hybrid cultivars. This is the case of Canada which promoted the "ice wine" made from the white grape Vidal, a hybrid resulting from the crossing of Trebbiano (Vitis vinifera) and Seibel (hybrid). But the project of modernization of the Brazilian wine sector follows different directions. While in Serra Gaúcha region, the actors involved in projects of GI aim their efforts at "qualification" of their production through the conversion of the vineyards into Vitis vinifera, the Progoethe project questions the built worldwide image of the "fine" wines as the only carriers of an inherent quality21 (Garcia-Parpet, 2009; Desplobins and Silva, 2005). One of the most important definitions of the GI code of practices for wines has to do with licensed cultivars. In each region, is defined a more or less restricted set of cultivars that can be used in wines searching for recognition. This is the way to seek identity and typicality for products. In theory, the choice is a kind of institutionalization of the past, endorsing the collective work of farmers throughout the historical process of experimentation, improvement and adaptation of the cultivars. However, this seemingly simple definition consists of a complex and contradictory process that involves a wide negotiation where the appeal to tradition is only one among several other justifications at play. In Brazil, the producers from Vale dos Vinhedos region were the first to come across this question: how can certain cultivars be "privileged" among some dozens produced in the region?Â A too narrow list would inevitably result in problems for the development of the project, taking into consideration the possibility of excluding a number of producers. Considering that this was an unprecedented project in the country and, therefore surrounded by suspicions of any kind, any measure that resulted in the exclusion of many producers could jeopardize its consolidation. So, the code of practices of the Indication of Source adopted a very open attitude, unusual among the most recognized GIs around the world: no less than 21 Vitis vinifera cultivars were approved for all the red and white wines allowed. In fact, the code of practices only recognized cultivars then present in the defined geographical area, except for maybe a few that were being grown in experimental criteria by wineries seeking innovative products. However, if on the one hand, this allowed for greater participation, on the other, created difficulties with regard to the search for identity and typicality for local wines. Especially for consumers, it remained extremely difficult to understand the characteristics of the local "terroir" in the face of the diversity of wines with which they face. Nevertheless, it was known from the beginning that this was only a consistent measure with the conditions necessary to create and maintain the IS, which invariably would be changed over time. The researchers involved in the project had clearly in mind that progress towards a DO, would require a more restrictive definition, an example of what occurs in the major wine regions of the world. Thus, the period between the recognition of IS and the creation of the code of practices for the DO was used to evaluate which cultivars have the potential to express the local "terroir". How was this assessment done? This is the question we seek to answer now. According to the rules of the DO project, red wines can be made only from the cultivars Merlot, Cabernet sauvignon, Cabernet Franc and Tannat. In the case of blends, the cultivar Merlot must compose at least 60% of total volume. As for varietal red wines, this percentage rises to 85%. As for white wines, a similar rule was defined for the cultivar Chardonnay, and the other cultivar allowed in the blend is the Riesling italic. As for the sparkling wines, the cultivars Chardonnay, Riesling italic and Pinot noir are indistinctly allowed. Nevertheless, the main novelty was the definition of the cultivar Merlot as representative of red wines. Although no less important is the decision in relation to the cultivar Chardonnay for white wines, but it was in relation to red wines that the most important discussions were held, for three basic reasons: First, the development of Vale dos Vinhedos region was with a change in the consumer preference in the domestic market from white wine to red wine, which, in turn, was associated with the widely publicized scientific discoveries about the properties of resveratrol as a lowering of cholesterol levels. It follows a second reason for the fact that red wines concentrate the highest sales volume of the local wineries. Finally, the negotiation about the cultivars for red wine production would necessarily be more complex due to the wide range of cultivars grown in the region, whereas, in the case of white wines, the dominance of the cultivar Chardonnay was widely recognized. The only consensus previously established referring to the interdict on hybrid and American varieties. Thus, it was prohibited in advance any possibility of claiming the relationship of identity of local wine with the cultivar Isabel - present in about 85% of the area currently under cultivation (Desplobins, 2005) - unlike what is held in Vales da Uva Goethe region, as noted previously. Without such a preliminary definition, the appeal to tradition could hardly be used as an argument to justify openly defensible choices that were being processed. However, to the extent that trading was restricted to a group of cultivars of wine grapes, the tradition goes back to a much more recent construction, reinvented through the process of modernization that was responsible for the increase of cultivars such as Cabernet Franc, Merlot and Cabernet Sauvignon in 1970-80s. Another highly plausible explanation concerns the importance of each cultivar in terms of production or area cultivated. In fact, the Merlot has always stood out as one of the main grapes for wine production. However, its production has rarely exceeded the one referring to Cabernet Sauvignon. Therefore, for some producers who consider the definition headlong in view of recent development of GIs in the region, it is like "putting on paper something that the land does not say". But should be said very soon! Although the DO has not yet been recognized, it already has repercussions on the growth of the area planted with Merlot, which should become the main wine grapes in the region. More than recognize a socio-productive system historically constituted, the project has a DO which has an executive role of this system. As a producer interviewed said, "Now you're talking about this: It is the Merlot. So everybody's planting Merlot, on land and in people's minds." Anyway, in the presence of an established standoff, "science" is required as a sort of "mediator" to the conflict. At least that impression was always sought to convey, when, in fact, it has a much more "performative" role than mediator. For most of the technicians involved with the project, there was no doubt that the defining criteria of cultivars would be defined primarily from agronomic and oenological research. Indeed, it was expected that studies on oenological potential and climate and soil adaptation of each cultivar (Rizzon and Miele, 2002, 2003; Zanus and Tonietto, 2006) constitute the necessary and sufficient justifications to convince all the actors. What happened, however, was that in addition to a good adaptation of the Merlot to the region, the same is also true in relation to other varieties, especially the Cabernet franc. Thus, some producers have even claimed the cultivar Cabernet Franc as an "icon of the Gaúcho wine" (Jornal Bon Vivant, abr.2008, p.11). However, it is a cultivar that, besides having a small volume of production and marketing, is rarely recognized among consumers, which could result in business problems. At this point, it seems enough to compare the cultivars Cabernet Sauvignon and Merlot in relation to the oenological potential. However, in this case there is no evidence for an unequivocal decision. An interviewed producer asserts that the Cabernet Sauvignon seems to produce the "wine that best expresses the potential of our terroir, but it is very difficult to produce because it depends on good years"; in a way that is proven to the extent that some of the observed so-called "icon wines" of the leading local companies.23 However, it is also necessary to consider the most commercial appeal of this wine (by the symbolism built around its name known worldwide), which obviously affects its prestige and price. Moreover, according to Ponte (2009), it must be acknowledged that these icon wines may waive this kind of recognition because they are usually associated with other qualification mechanisms based mainly in the endorsement by experts or specialized publications (the world of "opinion", cf. Boltanski and Thévenot, 1991). This is not necessarily the case in the Vale dos Vinhedos region where, the winery Miolo, for instance, begins to concentrate the production of their most prestigious wines, moving other wines to other regions. In the case of their icon wine (Miolo Lot 43), a major change in its composition is underway. If, when it was released into the market, it was made mostly with Cabernet Sauvignon grapes, Merlot now accounts for 50% of the assemblage, casting forth that from the recognition of the DO, this cultivar begins to dominate. In fact, more than simply recognize, the geographical indication system is redefining the standards of the local wine. Otherwise, the cultivar Merlot has been considered better suited to the region's soil and climatic conditions, which would allow a more uniform organoleptic/sensorial product. In other words, from the cultivar Merlot it is possible to produce from one year to another, wines with similar sensory attributes, which in turn becomes an important competitive element before consumers who demand a product with certain previously known features. The most direct consequence refers to the typicality that becomes more fluid to the need to create a pattern of "oenological identity". Finally, these arguments are also associated with a marketing justification for claiming that the Merlot has potential to become a kind of "emblematical cultivar" of the Brazilian wine, which is difficult to occur with Cabernet Sauvignon, a symbol of the globalization process and standardization underway in the wine market (Schirmer, 2007). This kind of argument is reflected primarily in the successful commercial experiences of Chile with the cultivar Carmenère, from Argentina with the Malbec and Uruguay with the Tannat. However, it touches on the reaction from producers outside the demarcated area for whom this cultivar should not be considered characteristic only of the Vale dos Vinhedos (81 km2), but the whole region of Serra Gaúcha. Indeed, as it unfolds another debate that we cannot enter here on the delimitation of areas relating to the GIs and the existence of different "terroirs" in each of these adjacent areas (Blume, 2008). In a recent article, Ponte (2009) discusses the different mechanisms of qualification in the wine market by associating GI to what the economy of conventions calls "domestic world." In this perspective, like the so-called direct market based on short circuits, the GI would constitute a form of coordination where the mechanisms for verifying quality, would primarily by the recurrence relations between producers and consumers, involving mechanisms of trust and reciprocity (Brodhag, 2000). In fact, the appeal to origin and the "terroir" can advocate this type of attachment. However, this mechanism is to confirm remote operating from a direct and personalized relation. The certification itself is an attempt to extrapolate the local circuits of production and consumption. The goal is to access wider markets transferring to a label recognizing traditions, customs and practices that characterize the socio-cultural embeddedness of these products. Thus, the valuation of assets recommended by the territorial GI does not occur as opposed to a global and sector dynamics, but associated with it. Currently, especially in the wine world, is more appropriate to consider the GIs from a much broader hybrid set of governance mechanisms. With the globalization of the wine market and ownership of this instrument in the new world, they are increasingly incorporated into the commercial and industrial dynamics, so that the component of territorial embeddedness of products coexists with the institutional framework of global value chains. This apparent territorial des-embeddedness reflects, in fact, the coexistence of multiple forms and degrees of embeddedness within a territory consisting of overlapping networks that operate at different spatial scales (Wilkinson, 2006; Sonino and Marsden, 2006). The qualification process occasioned by the geographical indication goes through the restoration of this socio-technical network. Along this restoration process, actors need to publicly justify their "investments" in regulatory and technological artifacts (Thévenot, 1986). Why a trademark rather than a GI? Why reject hybrid grapes in favor of grapes for winemaking? Why Merlot and not Cabernet Sauvignon? To this end, we show that the actors use different "judging criteria" (Eymard-Duvernay, 2009, Karpic, 2009). The existence of a qualification process is subject to the criteria used: the creation of reputation, increased productivity and efficiency, generating value-added, enhancement of collective heritage, social cohesion, promotion of territory, so forth. So, what for some is a clear example of product qualification and territory through the valuation of an intangible heritage, for others it can be seen as an unacceptable practice from the standpoint of generating technical efficiency - see the variety Goethe's case for the request of the Vales da Uva Goethe GI. These different evaluative orders coexist in a permanent state of tension, resisting the invasion of each other and trying to impose their way of justification. And the struggle continues even after the institutionalization of a code of practices. "Each agreement provides conditional and transitory features" (Joas, 1987). In fact, the quality exists only as a process of qualification, along which the interests and their justifications change (Sylvander et al., 2006). That was shown in relation to the shift in strategy pursued by the producers of sparkling wines from Garibaldi, which they approached to a more technical and industrial sector. This does not mean that other evaluating arguments are absent. In fact, all actors are forced to move between different justifications and the organizations display their simultaneous presence (Wilkinson, 2008; Dodier, 2001). Moreover, even if we can identify the preponderance of one or another order - commercial and technical in Vale dos Vinhedos region, patrimonial and domestic in Vales da Uva Goethe region - more importantly is the understanding of this complex interplay between values in the constitution of a negotiated order. As shown by Eymard-Duvernay (2009), this interaction occurs intermittently through communicative action to which actors are subject when they have to build an agreement on the standards and production rules. ALLAIRE, G. Quality in economics: a cognitive perspective. In: HARVEY, M.; McMEEKIN, A.; WARD, AL. (eds.) Qualities of food. Manchester: Manchester University Press, 2004. ALLAIRE, G. et al. Synthesis and scenarios analysis built on case study reports. WP6 REPORT, SINER-GI Project - Strengthening International Research on Geographical Indications: from research foundation to consistent policy, 2007. ALLAIRE, G.; SYLVANDER, B. Qualité spécifique et systèmes d'innovation territoriale. Cahiers d'Economie et Sociologie Rurales, n. 44, p. 29-59, 1997. BARHAM, E. Les indications geographiques dans le noveau monde : état des lieux et concepts. In: SYLVANDER, B., CASABIANCA, F., RONCIN, F. (Eds.). Produits agricoles et alimentaires d'origine : enjeux et acquis cientifiques. INRA, 2005. p. 173-183. BARHAM, E. Translating terroir: the global challenge of French AOC labeling. Journal of Rural Studies, v. 19, p. 127-138, 2003. BENKO, G.; PECQUER, B. Les ressources de territoires et les territoires de ressources. Finisterra, v. 36, n. 71, p. 7-19, 2001. BÉRARD, L.; MARCHENAY, P. From Localized Products to Geographical Indications: Awareness and Action. CNRS, 2008. BÉRARD, L.; MARCHENAY, P. Les produits de terroir entre cultures et règlements. Paris: CNRS, 2004. BLUME, R. Explorando os recursos estratégicos do terroir para a vitivinicultura brasileira. Tese (Doutorado em Agronegócios). Porto Alegre: UFRGS, 2008. BOLTANSKI, L.; THEVENOT, L. De la justification. Paris: Gallimard, 1991. BORGHEZAN, M.; ERN, R.; SILVA, A. L. da. Vales da Uva Gothe: indicação geográfica e desenvolvimento territorial. Florianopolis: Alternativa Grafica, 2008, v. 1, p. 76-91. BRODHAG C., Agriculture durable, terroirs et pratiques alimentaires. Courrier de l'Environnement de l'INRA, n. 40, p 33-45, 2000. BRASIL. Supremo Tribunal Federal. Recurso Extraordinário nÂº 78835 de 1974. Brasília, 25 de fevereiro de 1975. CALLON, M. Dos estudos de laboratório aos estudos de coletivos heterogêneos, passando pelos gerenciamentos econômicos. Sociologias, v. 10, n. 19, p. 302-321, 2008. CALLON, M. Introduction: the embeddedness of economic markets in economics. In: CALLON, M. (Org.) The Laws of the Markets. Oxford: Blackwell, 1998. p. 1-57. CALLON, M; MÉADEL, M; RABÉHARISOA, V. The economy of qualities. Economy and Society, v. 31, n. 2, p. 194-217, 2002. CAMARGO, U. A.; PROTAS, J. F. da S.; MELLO, L. M. de M. A viticultura brasileira: realidade e perspectivas. In: REGINA, M.A. (Org.). Viticultura e enologia: atualizando conceitos. Caldas: EPAMIG-FECD, 2002. p. 17-32. CASABIANCA, F ; SAINTE MARIE, C. (de). To design innovations for the typical products. Some lessons from the Corsican dry pork products, In: 52éme Séminaire EAAE, Parme, Italia, 1997. CERDAN, C. ; VITROLLES, D. Valorisation des produits d'origine : contribution pour penser le développement durable dans la Pampa Gaúcha au Brésil. Géocarrefour, v. 83, n. 3, 2008. CERDAN, C. ; VITROLLES, D. ; DELFOSSE, C. ; VELLOSO, C. Q. ; NABINGER, C. ; SILVA, A. L. (da). Penser la conservation des ressources bioculturelles sous l'angle de la valorisation de l'origine : la mise en place d'indications géographiques dans le Sud Brésil. Autrepart, n. 50, p. 153-166, 2009. CHADDAD, F.R. Denominações de origem controlada: uma alternativa de agregação de valor no agribussines. Dissertação (Mestrado em Administração). São Paulo: USP, 1996. COMITE INTERPROFESSIONNEL DU VIN DE CHAMPAGNE. L'appellation Champagne. Les clés des vins de Champagne, 2009. Disponível em http://www.champagne.fr. Acesso em 22/02/2010. CORMIER-SALEM M.-C. ; ROUSSEL, B., Localiser les produits et valoriser les spécialités locales. Une dynamique générale et foisonnante, Autrepart, n 50, p. 3-16, 2009. DELFOSSE C., La France fromagère (1850-1990). Paris : Editions La Boutique de l'Histoire, Mondes ruraux contemporains, 2007. De PARIS, A. Memórias: Bento Gonçalves-RS - fundamentação histórica. 2 ed. Bento Gonçalves: Arquivo Histórico Municipal, 2006. DESPLOBINS, G. Tradition contre modernisn dans la vitiviniculture bresilienne. Agroalimentaria, n. 21, p. 29-42, 2005. DESPLOBINS, G. ; SILVA, A.L. Construção de qualidade e de reconhecimento na vitivinicultura tradicional do vale do rio do peixe, em Santa Catarina. Cadernos de Ciência & Tecnologia, v. 22, n. 2, p. 399-411, 2005. DODIER, N. Agir dans plusieurs mondes. Critiques, n. 529-530, p. 428-458, 1991. DOUGLAS M.; ISHERWOOD, B. O mundo dos bens: para uma antropologia do consumo. Rio de Janeiro: UFRJ, 2004. EYMARD-DUVERNAY, F. L'économie des conventions entre économie et sociologie. In : STEINER, P. ; VATIN, F. (Eds.) Traité de sociologie économique. Paris: PUF, 2009. pp. 131-164. FENSTERSEIFER, J. E. The emerging Brazilian wine industry: challenges and prospects for the Serra Gaúcha wine cluster. International Journal of Wine Business Research, v. 19, p. 187-206, 2007. FLORES, M.X. Da solidariedade social ao individualismo: um estudo sobre o desenvolvimento do vale dos vinhedos na serra gaúcha. Tese (Doutorado em Sociologia Política). Florianópolis: UFSC, 2007. FORT, F., PEYROUX, C., TEMRI, L. Mode de gouvernance des signes de qualité et comportements d'innovation: une étude dans la région Languedoc-Roussillon. Économie rurale, n. 302, p. 23-39, 2007. GARCIA-PARPET, M.F. Le marché de l'excellence: les grands crus à l'epreuve de la mondialisation. Paris: Seuil, 2009. GARCIA-PARPET, M.F. Mundialização dos mercados e padrões de qualidade. Vinho: o modelo francês em questão. Tempo Social, v. 16, n. 2, p. 129-150, 2007. GIULIANI, E. The selective nature of knowledge networks in clusters: evidence from the wine industry. Journal of Economic Geography, v. 7, p. 139-168, 2007. GOLLO, S.S. Delineamento e aplicação de Framework para análise das inovações numa perspectiva de processo interativo: estudo de caso da indicação de procedência vale dos vinhedos - Serra Gaúcha/RS. Teoria e Evidência Econômica, v. 14, p. 247-277, 2006. GONÇALVES, M.F.W. Propriedade industrial e a proteção dos nomes geográficos: indicações geográficas, indicações de procedência e denominações de origem. Cuiabá: Juruá, 2007. KARPIC, L. Éléments de l'économie des singularités. In : STEINER, P. e VATIN, F. Traité de sociologie économique. Paris: PUF, 2009. pp. 165-208. JALFIN, A. Elementos para o estudo da agroindústria vinícola: uma abordagem da Cooperativa Vinícola Aurora. Ensaios FEE, v. 14, n. 2, p. 689-708, 1993. JALFIN, A. Elementos para o estudo da agroindústria vinícola: uma abordagem da Indústria Vinícola Rio-grandense. Ensaios FEE, v. 12, n. 1, p. 229-247, 1991. JOAS, H. Symbolic Interactionism. In: GIDDENS, A.; TURNER, J. (Eds.) Social Theory Today. Stanford, CA: Stanford University Press, 1987. pp. 82-115. JORNAL BON VIVANT. Uma nova era na 'Terra do espumante brasileiro'. Garibaldi, dez. 2008. p. 13. LAPOLLI, J.N. et al. A competitividade da vitivinicultura brasileira: análise setorial e programa de ação com destaque para o Rio Grande do Sul. Porto Alegre: Banrisul / Embrapa-CNPUV / Sebrae-RS,1995. LASH, S.; URRY, J. Economies of signs and space. London: Sage, 1994. MARIOT, E. J. Produtos agroalimentares típicos (coloniais): situação e perspectivas de valorização no município de Urussanga, Santa Catarina, Brasil. 111p., 2002. MASCARENHAS, G. Indicações geográficas no Brasil: principais fatores determinantes do seu reconhecimento e desempenho. In: Encontro Nacional de Estudos do Consumo, 4, Anais..., Rio de Janeiro: CPDA, 2008. MIELE, M.; ZYLBERSTAJN, D. Coordenação e desempenho da transação entre viticultores e vinícolas na Serra Gaúcha. Revista de Administração, v. 40, n. 4, p. 330-341, 2005. NIEDERLE, P.A. A incorporação do conceito de Indicação Geográfica na vitivinicultura brasileira. In: Congresso de Estudos Rurais, IV. Aveiro: SPER, 2010. pp. 1317-1324. NIEDERLE, P.A. Controvérsias sobre a noção de indicações geográficas enquanto instrumento de desenvolvimento territorial: a experiência do Vale dos Vinhedos em questão. In: Congresso Brasileiro de Economia, Administração e Sociologia Rural, 47, Porto Alegre: SOBER, 2009. NOSSITER, J. Gosto e poder: vinho, cinema e a busca dos prazeres. São Paulo: Companhia das Letras, 2009. PEREIRA, G.M.. A região do vinho do Porto: origem e evolução de uma demarcação pioneira. Douro, estudos e documentos, n. 1, p. 177-194, 1996. PONTE, S. Governing through Quality: Conventions and Supply Relations in the Value Chain for South African Wine. Sociologia Ruralis, v. 49, n. 3, p. 236-257, 2009. PROCISUR - Programa Cooperativo para el Desarrollo Tecnológico Agropecuario del Cono Sur Desarrolllo. Trayectoria y demandas tecnológicas de las cadenas agroindustriales en el MERCOSUR ampliado. Vino y Frutas. Montevideo: BID, 1999. PROTAS, J.F.S. A produção de vinhos finos: um flash do desafio brasileiro. Agropecuária Catarinense, v. 21, n.1, 2008. PROTAS, J.F.S. Programa de desenvolvimento estratégico da vitivinicultura do Rio Grande do Sul - Visão 2005. In: Congresso Latino Americano de Viticultura e Enologia, 10, Anais... Bento Gonçalves, Embrapa: 2005. p.109-130. REBOLLAR, P. M.; VELLOSO, C. Q.; ERN, R.; VIEIRA, H. J.; SILVA, A. L. Vales da Uva Goethe. Urussanga: Progoethe, 2007. RIZZON, L.A., MIELE, A. Avaliação da cv. Merlot para elaboração de vinho tinto. Ciênc. Tecnol. Aliment., v. 23(Supl): 156-161, 2003. RIZZON, L.A., MIELE, A. Avaliação da cv. Cabernet Sauvignon para elaboração de vinho tinto. Ciênc. Tecnol. Aliment., v. 22, n. 2, 2002. RODRIGUES, C. H. M. A indústria vinícola gaúcha e o capitalismo: um universo de luta e sobrevivência. Ciências & letras, n. 41, p.101-118, 2007. ROESE, M. O mondovino de cabeça para baixo: as transformações no mercado internacional do vinho e o novo empresariado vinícola. Rev. Sociol. Polít., v. 16, n. 31, p. 71-83, 2008. SANTOS, J.R.L. O processo de abertura comercial brasileiro e os impactos sobre a vitivinicultura gaúcha - 1980-1997. Dissertação (Mestrado em Economia). Campina Grande, PB: UFPB, 1999. SATO, G. S. Vinícola Miolo, criando reputação no mercado de vinhos: um estudo de caso. In: XLII Congresso Brasileiro de Economia e Sociologia Rural, 2004, Cuiabá. Anais... Brasília: SOBER, 2004. SAUTIER, D., BIENABE, E., SALLEE, B. Les indicatons géographiques dans les pays du sud : potentiel et anjeux. In: SYLVANDER, B., CASABIANCA, F., RONCIN, F. (Eds.) Produits agricoles et alimentaires d'origine. INRA/INAO, 2005. p. 184-198. SCHIRMER, R. Les vins du Nouveau Monde sont-ils a-géographiques? Bulletin de l'Association des Géographes Français, v. 1, p. 65-80, 2007. SILVA, T.N. et al. Redes de cooperação, desenvolvimento tecnológico e indicadores de competitividade da cadeia do vinho. In: International Pensa Conference, 5, Anais... São Paulo: USP, 2005. SLUSZZ, T.; PADILHA, A.C.M. Estratégias de internacionalização dos espumantes: um estudo de cinco vinícolas do Rio Grande do Sul. Revista Brasileira de Gestão e Desenvolvimento Regional, v. 4, n. 4, p. 3-24, 2008. SONINO, R.; MARSDEN. T. Beyond the divide: rethinking relationships between alternative and conventional food neworks in Europe. Journal of Economic Geography, v. 6, p. 181-199, 2006. SYLVANDER, B.; ALLAIRE, G. 2006. Siner-GI WP3 Report : conceptual synthesis. Montpelier: SINER-GI. SYLVANDER, B. et al. Qualité, origine et globalisation: justification génerales et contextes natinaus, le cas des Indications Geographiques. Canadian journal of Regional Science, n. 29, v.1, p. 43-54, 2006. THEVENOD-MOTTET, E. Legal and institutional issues related to GIs. Siner-GI WP1 REPORT, 2006. THEVENOT, L. L'action au pluriel: sociologie des régimes d'engagement, Paris : La Découverte, 2006. THÈVENOT, L. Les investissements de forme. In : THÈVENOT, L. (Ed.). Conventions économiques. Paris: Presses Universitaires de France, 1986. pp. 21-71. TONIETTO, J. Afinal, o que é Terroir? Bon Vivant, Flores da Cunha, v. 8, n. 98, p. 08, 2007. TONIETTO, J. Experiências de desenvolvimento de indicações geográficas: vinhos da Indicação de Procedência Vale dos Vinhedos. In: LAGES, V.; LAGARES, L.; BRAGA, C. (Orgs.). Valorização de produtos com diferencial de qualidade e identidade. Brasília: Sebrae, 2005. p. 146-162. TONIETTO, J. Vinhos brasileiros de 4Âª geração: o Brasil na era das indicações geográficas. Comunicado Técnico, n. 45. Bento Gonçalves, RS: Embrapa: 2003. TONIETTO, J.; CARBONNEAU, A. Análise mundial do clima das regiões vitícolas e de sua influência sobre a tipicidade dos vinhos: a posição da viticultura brasileira comparada a 100 regiões em 30 países. In: IX Congresso Brasileiro de Viticultura e Enologia, Anais... Bento Gonçalves: Embrapa, 1999. TONIETTO, J.; FALCADE, I. Vinhos regionais: regulamentação no Brasil. In: Congresso Brasileiro de Viticultura e Enologia, 10, p. 153-157. 2006. UVIBRA - União Brasileira de Vitivinivultura. Importação de vinhos - procedência. Disponível em www.uvibra.com.br. Acesso em 03/02/2009. VALCESCHINI, E.; NICOLAS, F. La dynamique économique de La qualité agro-alimentaire. In:Â NICOLAS, F. ; VALCESCHINI, E. Agroalimentaire: une économie da la qualité. Paris: INRA-Economica, 1995. p. 15-37. VALDUGA, V. O processo de desenvolvimento do enoturismo no Vale dos Vinhedos. Dissertação (Mestrado em Turismo). Caxias do Sul: UCS, 2007. VANDECANDELAERE, E.; ARFINI, F.; BELLETI, G.; MARESCHOTTI, A. 2009. Linking people, places and products. FAO, Sinergi: Rome. VAN DE KOP, P. SAUTIER, D.; GERZ, A. (Eds.). 2006. Origin-labeled products: lessons for pro-poor market development. Bulletin 372. Amsterdã: KIT; Montpelier: CIRAD. VELLOSO, C. Indicação geográfica e desenvolvimento territorial sustentável: a atuação dos atores sociais nas dinâmicas de desenvolvimento territorial a partir da ligação do produto ao território (um estudo de caso em Urussanga, SC). Dissertação (Mestrado em Agroecossistemas). Florianópolis: UFSC, 2008. WILKINSON, J. Network theories and political economy: from attrition to convergence? In: MARSDEN, T.; MURDOCH, J. Between the local and the global: confronting complexity in the contemporary agri-food sector. Amsterdam: Elsevier, 2006. p. 11-38. ZANUS, M.C. ; TONIETTO, J. Riesling Itálico: um vinho emblemático para a Serra Gaúcha/Brasil. In: Congresso Brasileiro de Viticultura e Enologia, 10, p. 147-152. 2006. 1Â Professor at Federal University of Paraná (UFPR). E-mail: paulo.niederle@yahoo.com.br. 2 Doctoral student of geography (LER/Université Lyon 2, UMR-Innovation/CIRAD). E-mail: dvitrolles@gmail.com. 3 European project developed between 2005 and 2008 whose aim was to produce comparative analysis of different qualification systems related to the origin of products. 4 Besides these four products, currently the Brazilian National Institute of Intellectual Property (INPI) also recognizes as GI Vale do Sinos for finished leather, Vale do Submédio São Francisco for grape and mango, Litoral Norte Gaúcho for rice and Pinto Bandeira for fine wines (list updated in September 2010). 5 Some authors suggest that GI can be a hindrance to innovation due to the strong regulatory framework to which producers are submitted (Chaddad, 1996; Garcia-Parpet, 2004). Otherwise, evidenced by Fort, Peyroux and Temri (2007), assuming that in the present context, it is a mechanism that stimulates processes of technical and organizational innovation. 6 The data that will be presented are from the research thesis of both authors, which fall within the scope of the CAPES-COFECUB Project n. 649/09 developed from a cooperation agreement between universities and research centers in Brazil (UFRRJ, UFSC, EPAGRI) and France (Université Lyon 2, UMR Innovation). 7 The agreement with Chile provides a differentiated tax of 13.5%, which should be reduced to zero in 2011. 8 Protas (2005) highlights a number of other difficulties faced by the domestic industry that will not be addressed here: the concentration of distribution through large retailers and the growing importance of private labels; variability and inconsistencies in product quality, contractual problems in relations between growers and winemakers, absence of active monitoring of wine; oligopoly suppliers of inputs; minor importance of the segment in the domestic economy; and high tax burden. 9 The indication of origin for wines Pinto Bandeira was granted in July 2010, after writing this article. 10 The decision relates to the lawsuit filed by Société Anonyme Lanson Pere & Fils against the local wineries that made use of the designation. See (Brasil, 1975). 11 See also the case of Vinho do Porto, produced in the region of Douro and bottled in Vila Nova de Gaia town (Pereira, 1996). 12 There are a number of differences between these instruments of intellectual property right that cannot be addressed here. For a conceptual review, see Thévenod-Mottet (2006) and Gonçalves (2007). 13 Even so, the RAC provides respect for the GIs pre-established in other regions, so that the certified sparkling wines will be prohibited from using the name Champagne or Champanha. 14 We are unable to enter here in a long and controversial discussion about the supposed standardization process underway in the world of wine due to the predominance of just a technical paradigm during this process. See Nossiter (2009), Roese (2008), among others. 15 The colonists brought Vitis vinifera varieties such as the San Giovese, Nebbi, Barbera, Bonarda, and Peverell Bernacci. However, due to unfavorable soil and climatic conditions, these cultivars were soon abandoned. The expansion of production only occurred with the arrival of American varieties, particularly the cultivar Isabel. To this day are called "colonial" wines for everyday consumption coming from this and other non-vinifera cultivars (Desplobins and Silva, 2005). 16 Vinifera grape derived from a cross between Muscat of Alexandria and Schiava Grossa. 17 Hybrid grape derived from the intersection of Isabel with another hybrid cultivar of Vitis vinifera. 18 Until then, in all the producing regions, the traditional system in "trellis" was almost exclusively (Desplobins, 2005). This system was being replaced by new modes of conduct (or lyre or espalier) better adapted to the production of "quality grapes", which require more sun exposure and ventilation. 19 "You can no longer release a GI in a "silver platter" by simply basing on a survey of journalism and so forth. You must ensure and require that it have proof technique" (Researcher interviewed). As Boltanski and Thévenot (1991) alluded, each system of qualification is also associated with the different forms of "relevant knowledge": e.g. monographic surveys in the "domestic world"; statistical analysis in the "industrial world". 20 These ideas were confirmed in interviews with other members of the Progoethe for Goethe wine, producers and technicians connected to the production of cheese Serrano and associated to Apropampa for the meat from Pampa Gaúcho da Campanha Meridional. 21 From Wikipedia:"Fine wine is a sort of table wine given to drinks exclusively produced with wine grapes, and thus are considered superior quality wines" (pt.wikipedia.org / wiki / Vinho fino, emphasis added). 22 Moreover, according to the project of regionalization of production associated with the GIs, this will be the characteristic product from the region of Farroupilha (Tonietto and Falcade, 2006). 23 On the site of the Cordelier winery, for example, their "Cabernet Sauvignon Reserve" is presented as a "fine red wine that clearly expresses the characteristics of a typical wine of the Vale dos Vinhedo region" www.cordelier.com.br. Accessed on February 17, 2010. 24 The distinction, in French, comes from the cultural meaning of the terminology Cultural, best translated as a system of cultivation, while "culturelle" refers to the cultural sphere as a set of values and social representations. 25 This as opposed to a sociocultural perspective in which the parameter to explain the relationship between the product and its origin is the know-how collectively shared (Bérard and Marchenay, 2007). In this case, what is at stake is the recognition of an evolutionary process in which innovations and traditions are mixed to form a typical product identified with a human community and the space it occupies.